Mark McGovern of the Queensland University of Technology’s Business School recently had a paper published in the peer-reviewed free online journal Economic Analysis and Policy. It is entitled Beyond the Australian Debt Dreamtime: Recognising Imbalances, and is well worth a read. Only 24 pages. Sadly, all the efforts of a generation of Australian men and women have only made them more indebted to the rest of the world. Australia’s external net wealth is negative, soon passing minus $900b on an accelerating downward trajectory. This ongoing dissipation of national resources is unsustainable. Australians live in a debt dreamtime, one from which the rest of the world has been rudely awakened. After years of inadequate policies, the nation has a large external debt and significant government exposures. Servicing pressures are growing as rising uncertainties permeate global credit markets. Reserve Bank policies are worsening Australia’s external position and needlessly driving up internal costs. Major policy rethinking is warranted. Relevant issues are still little considered, crowded out of dialogues by comforting myths that accompany the Australian Debt Dreamtime. Imbalances need proper recognition with new approaches and strategies developed. Automatic corrections will not occur as history and current overseas experiences demonstrate. A real awakening, improved positioning and a touch of luck are required if Australians are to avoid being seriously impoverished by world events and their own confused Dreaming. Rising problems have gone addressed because current preferences ignore them. Australians and their policy makers need to wake from their economic and financial dreams before they stumble into an economic crisis. 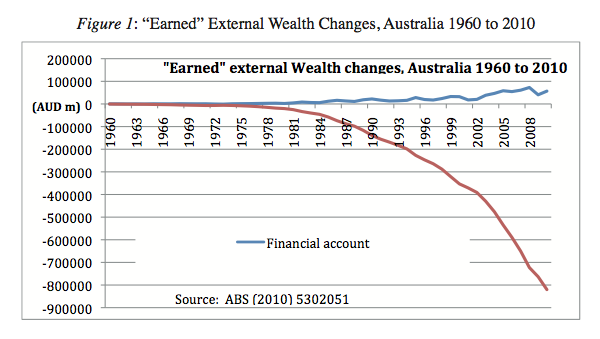 The net external wealth of Australia has deteriorated across the generation (McGovern 2010b, from which Figure 1 is drawn). Calculation of external wealth is based upon cumulative financial surpluses from an essentially zero basis in 1960. As is evident, Australia has been increasingly building external liabilities. A particularly marked decline has occurred over the last decade resulting in a total external exposure of $820b as at June 2010 with an annual deterioration of over $50b. Manasse and Roubini (2005) empirically explore past crisis experiences to investigate “the set of economic and political conditions that are associated with a likely occurrence of a sovereign debt crisis”. They derive rules of thumb for likely default. Their schema is applied to Australia as shown in Figure 2. Importantly, Australian external obligations are largely held privately so at face value the sovereign appears little exposed externally. Importantly also, these are held in Australian dollars. However, the sheer bulk of obligations held by banks deemed “too big to fail” in the Australian context, the sizeable Commonwealth, State and local government debts (Section IV), the uncertainties of currency regimes, the indirect sourcing of some monies and the existence of various guarantees and understandings drive de facto and potential de jure exposures. This is precisely what your humble blogger has long argued. That for all the reassuring rhetoric from Goose (and assorted singing-for-their-supper, vested-interest economists) about how our debt is nothing to worry about, the truth is this. Their constant references to our “comparatively” “low” public debt “as a percentage of GDP”, is a red herring to distract our attention. The real risk lies hidden just below the surface. The real risk is in the liabilities of our banking system. Which the Labor government has guaranteed. Events in Europe have shown how quickly and broadly crises can build. It was only two years ago that the European Commission praised Italy, including its “greater resilience to external shocks”. Now Italy is under administration with no politician in the new cabinet (Squires 2011) as, in PM Monti’s words, this “will remove one ground for disagreement”. How the government of Italy is for Italy will be revealed in the days to come. There is much to ponder in current developments, and lessons for Australia. Of particular interest to your humble blogger is the following excerpt concerning the long run effects of so-called trade “liberalisation” on Australia’s ever-deteriorating external wealth situation. … the stunning thing about Australian External Wealth (Figure 1) is that we have now being waiting for some thirty year for payoffs from hosting visiting funds and investments yet the position is, if anything, deteriorating more rapidly. More tellingly, the most optimistic figures about the current boom do not adequately address Australia’s External Wealth/Obligations problem… Dreaming of resurrecting Doha or of Trans-Pacific Partnerships introduces nothing new, and some fundamental changes are now of the essence. While political exaggerations from “delighted” and “excited” Ministers are understandable, the proper response by the governments of Australia is to demonstrate how mooted changes will be good for Australia, specifically in rectifying Australian external imbalances. Put bluntly, Australia’s external position deteriorated as trade liberalisation advanced so any net opportunities that may have been on offer were not realised. Why should the impacts of any further liberalisations been any different? When Finance Ministers agree that across APEC “growth and job creation have weakened, inflation remains elevated [and] Capital flow volatility has intensified in response to heightened risk aversion” (APEC 2011), proponents need to demonstrate with convincing evidence how proposals will reduce risks and rectify problems in the current environment and going forward. More of the same is not an answer. McGovern has an entire section devoted to interest rates, and their real impacts on investment, growth, and imbalances in our economy. It’s excellent. Australians have been paying historically high real interest rates for some decades now. The interest-only component of a 30-year loan has been steadily rising, from zero in real terms for loans terminating around 1980 to five-and-a-half percent for those terminating today (McGovern 2010a). Meanwhile, real growth rates in Australia and around the world have been declining. Arguably, in recent decades the reliance on interest rate movements in inflation targeting along with an insensitive allocation of rates across investment classes have compounded problems and raised investment risk while doing little for inflation objectives. Clearly this challenges current conventions in Australia, and elsewhere, but an argument needs to be had. Reserve Bank of Australia decisions of interest rates may be well be worsening not only Australian competitiveness (since investment becomes markedly more expensive and unattractive as next discussed) but also its external position (as then discussed). High Australian interest rates also impact on Australia via the carry trade. While the potential profits from this are recognised (making even the textbooks, Feenstra and Taylor 2008), the impacts on domestic monies are less appreciated. Monies that flow into a nation’s currency pool may well be utilised within the nation by eager lenders sitting on these substantial deposits… there is a marked and little monitored (let alone regulated) increase in the quantity of money in circulation. It is then but a short step to an asset bubble, particularly in investments such as housing which are deemed “prime” by distant institutions. The possibility that actions by the Reserve Bank in Australia may be worsening the external situation in a variety of ways needs to be investigated further. I’ve said it before. It bears repeating. And with it, the $1 million salaries of “public servants” like RBA Governor Stevens. It is fascinating that Government financial situations were not assessed in either Henry (2010) or in the lead up to the Tax Forum (Commonwealth Treasury 2011). Instead the focus has essentially settled on who to tax more, and the purported efficiencies of different ways to do it. Why there is a need for governments to raise more tax goes unaddressed, as do other relevant considerations. Such myopia appears to be risky and, probably, dangerous. The Commonwealth has a stated net exposure of $124b as at June 30 2010 (with an additional $67b in liabilities taken on in the following year). The States generally appear close to financial balance. However, those States using Treasury Corporation are on-lending to their various agencies with high interest repayments expected in return. Rising utility service prices, for example, appear influenced by high bond servicing costs, an issue not commonly recognized. Inflationary effects result. There you have it folks. State government borrowings, on-lent at high interest rates to state government “agencies”, are driving up your electricity and water charges. • that more adequate, consistent and complete reports are needed. … Queensland which is not projecting a surplus (of $0.1b) across the general government sector until 2015- 16 increased its debt by $4.2b in the last year. It is planning to continue capital investments of over $10b annually for some years (Queensland Treasury Corporation 2011a). Why State debt more than doubled in four years, from $32.1b in 2006-07 to $73.1b in 2010-11, despite around $15b from asset sales (ibid) is an unexplained mystery, as is the lack of discussion of such a significant increase in exposure while global conditions were deteriorating markedly. Queensland state debt only doubled in four years? Federal Labor have more than quadrupled Commonwealth government debt in four years. From just over $50b when they came to office in Nov 2007, to over $223b today. Which of the challenges raised by Moody’s in 2009 have been adequately addressed, in Queensland and elsewhere? “The [Queensland] downgrade reflects the state’s deteriorating financial and debt performance and the absence of a medium-term strategy that would over time restore budgetary performance and financial flexibility… the state is expected to produce a series of very large, recurring deficits. The widening budget gaps and the resulting additional borrowing that is being projected place the state on a debt trajectory that is no longer consistent with Aaa debt metrics. Additional budgetary pressures could emerge should economic growth be slower than currently anticipated. Queensland’s financial performance is also expected to be challenged by the difficulties in reducing operating spending following a period of accelerated growth.” (Moody’s Investor Services 2009). It is clear that not only are liabilities, specifically debts, high. In terms of the presented accounts, assets appear to reasonably match liabilities given current valuations. If so, any anticipated problems would be ones of liquidity rather than solvency. That is, the central problem is one of achieving appropriate flows of revenues and payments while maintaining (or perhaps improving upon) the stock situation. If however, assets were not realizable at the stated values then solvency problems can arise. As evident in Europe, one response is partial or full default on obligations. If a debt-deflation were to occur then the States could be quickly squeezed as asset values fall while liabilities at least remain. What McGovern is arguing is that it is the state government balance sheets that pose a risk. That’s important, as you will see in a moment. As the fires feeding on years of lush credit growth rage in many parts of the world, Australia has been so far only a little affected. Significant exposures exist, however, and these need to be assessed and redressed. While no one can know just what blazes will break out next or where, prudence mandates risk assessments, readiness, firebreaks and controlled burns. Recovery is much more expensive after an unanticipated fire, and some losses are never really replaced. As even Kunbul knows, this is not a time to be dreaming up a gum tree. Current external policies favour a major expansion of mining to lead export growth. However, the current mining sector would need to roughly double its exports for Australia to stand still externally. It is not only the trade balance that has to be rectified but also the net factor income outflows. Given that mining is focused in three States that already have high public liabilities, funding further infrastructure becomes even more problematic. Superficially the Governments of Australia appear in a reasonable position when compared to much of the world. Servicing of obligations appear problematic, however, even under optimistic scenarios. Closer investigations of positions is clearly warranted. This initial review has revealed significant potential vulnerabilities. Adverse conditions externally could lead to a rapid deterioration due to refinancing risks while recession would reduce the ability to raise sufficient net revenues to service existing obligations. Reduced ability to “service existing obligations”, eh? What was it exactly that Senator Joyce warned of in 2009-10? What was it that unleashed all the verbal fire and brimstone that cost Barnaby his new job? What exactly did he say that so angered the Labor government, then Treasury secretary Ken Henry, and all the “leading” talking head economists in the land? No, it was not just his warning about the dangers of the ever rising US debt level. It was his warning about Australia, and the vulnerability of the state governments’ finances, that really fired them up. He said the Federal Government’s debt would push up interest rates and predicted that some state Labor governments would not be able to repay their borrowings. ”The Federal Government has $115.7 billion in debt, Australian government securities, notes and bonds on issue, and the states have another $170 billion in debt. Senior government figures have taken aim at Barnaby Joyce’s dire warning about a global financial meltdown if the United States government defaults on its debt. Mr Joyce also came under fire for comments about the financial health of Australian states. ”That’s shooting from the lip, making it up on the run,” Prime Minister Kevin Rudd said of the new opposition finance spokesman’s comments. Senator Joyce is concerned that demand for Australia’s resources would ”go through the floor” if the US was not able to pay off its burgeoning foreign debt. Mr Rudd dismissed the senator’s comments, describing them as ”not responsible economic policy”. Assistant Treasurer Chris Bowen went further saying Senator Joyce’s comments were extremist. ”His comments on the United States need to be taken with a grain of salt,” he said, adding the vast majority of economists believed US debt levels were manageable. He accused Senator Joyce of engaging in a series of thought bubbles that were unbecoming of a senior economics spokesman from either government or opposition. Separately, Mr Rudd criticised comments made by Senator Joyce that some Australian state governments might not be able to repay billions of dollars in debt. The states were carrying $170 billion in debt and rising interest rates were affecting their capacity to make repayments, Mr Joyce said. ”I would say in some instances they do not, particularly Queensland,” he told Fairfax Media. The Prime Minister said such ”erratic and ill-considered” comments should not be made by a senior opposition spokesman. Mr Rudd described as the ”most serious charge” the coalition’s view that state governments could default on their debt. In light of Mr McGovern’s paper, and the reality of world events over the past 2 years, the truth is clear. Like 99% of economist McGovern thinks it is all to do with money. The real crux of the matter is the peaking of oil production and the escalating cost of energy. While energy is busy eating GDP how can loans & interest be paid ? Without energy there is no growth. Welcome to the zero growth world ! Yours was one of the best, most on-the-ball and insightful papers I’ve read in a long time, Mark. Thank you for authoring it, and for seeking to draw attention to these fundamental, yet invariably overlooked issues. You would be welcome to Guest Post or cross-post here on BiR, to help give your insights wider exposure, if that is of interest.